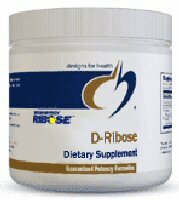 D-Ribose is a simple 5-carbon monosaccharide used by all living cells as an essential compound in cellular energy metabolism. Ribose, needed to synthesize adenine nucleotides, is the carbohydrate backbone of genetic material—DNA and RNA, certain vitamins, and other important cellular compounds. Without ribose, tissues could not produce these life giving compounds. Adenine nucleotides are required by heart, muscle and other tissue to make adenosine triphosphate (ATP), the primary source of energy used by all cells to maintain normal health and function. When the pool of adenine nucleotides is depressed by disease or strenuous exercise or activity, the level of energy available to the cell is compromised. A reduction in cellular energy level can lead to diminished function and reduced physiological health. Ribose, taken before, during or after high-intensity exercise, accelerates replenishment of depleted adenine nucleotide pools, keeping ATP and TAN levels at their peak, and providing rapid regeneration of critical energy molecules for maximal training.